Oh snap! It is Comic-Con starting today!! Here is a picture of Kylo Ren after I had a tons of fun throwing white out all over him. Drawing fake white out snow is always fun and gives a picture that edgy, unpredictable quality that makes it look more vibrant. For example, look at how I drew his feet fading out. It has a cool snow out effect that I would not have been able to accomplish without white out. 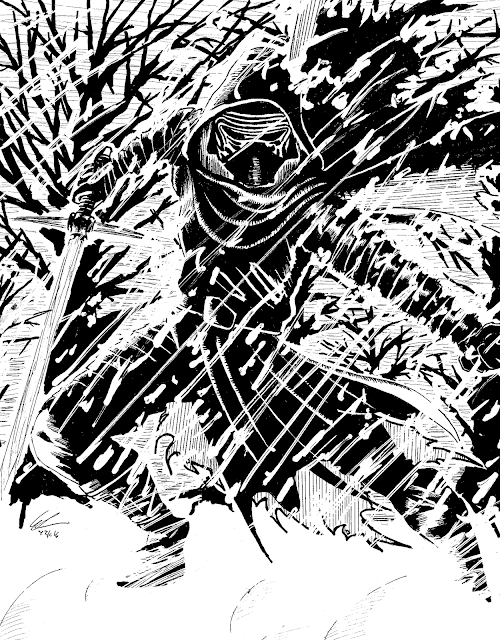 A challenge that I had was since Kylo Ren is all black and I wanted to draw him in the darkness with a black forest behind him. Obviously, that is easy to get details lost in the blacks. The technique is to have a white out line around Kylo so he does not get lost in the background.